Not far from our weekend home in Sonoma County, is a wonderful winery called Bella Vineyards. We decided to check it out as we heard they had wine caves! Sure enough! They had a cave carved right into the hill. Notice the vines up above. 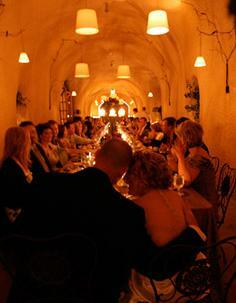 Upon entering, there is a long room with the tasting table at the end. To the right is a small dining room--see below. I can imagine how magical it would be to have a special birthday or a wedding here. The temperature inside is 60 degrees. Perfect for storing wine. It felt nice and cool, compared to the 80 degrees outside. Outside, is a nice picnic area planted with 150 year old olive trees. 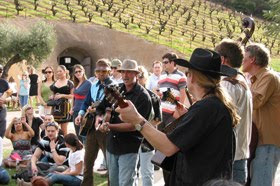 It's the perfect setting for the music events and entertainment the winery hosts during the summer. How gorgeous is this setting? It couldn't be lovelier, nestled in the upper Dry Creek Valley of Sonoma County. Bella Vineyards are known for their zinfandel wines. Here is an old vine sprouting brand new leaves. Beautiful! Of course, we bought a couple bottles of zinfandel to age! For more information about Bella Vineyards, visit their beautiful website here. I plan on featuring various Sonoma wineries throughout the spring and summer months for those who haven't yet been to the California Wine Country, and for those who need a little reminder of how beautiful it is here. I'm joining Susan at A Southern Daydreamer for "Outdoor Wednesday." Be sure to visit her blog for more outdoor photography inspiration. Hola Delores, there`s so much beauty around vineyards everywhere in the world, this one is very beautiful too. Here in Chile so many wine warehouses and old houses related to them have been put down by the earthquake, one of the biggest in the history, and now best wines of Chile are pooring down the roads in many cities... how sad. Thank you for your interest in my blog, yours is truely gorgeous!! OH, I love wine country. We traveled through there 8 years ago and I fell in love! Thanks for the tour. Would love to visit there someday. How wonderful to have a weekend home in the wine country! Thanks for sharing photos of your visit to this beautiful vineyard. How cool is that wine cave! Would love to have a party there! I love Sonoma. My daughter went to school at Sonoma State. The vineyard is beautiful and I can definitely envision a first class event at a place like this! Thanks for sharing! I want to do this soooo bad. We are fairly close too, so maybe someday! Looks wonderful! Thank you so much for the tour of Bella Vineyards. The cave is amazing!! Would love to visit. Thanks for sharing the information and fantastic photos! What a wonderful place to visit! Looks so romantic and dreamy. Thanks for the tour! I'm visiting, this time, from Outdoor Wednesday! How interesting, I've always wanted to visit a vineyard! Thanks for the wonderful tour! What wonderful photos, and I haven't heard of a wine cave before. You have some special places to visit there! I have visited several of the wineries in the area though, but not "Bella". I need to put a making a visit there on my "to do" list!! The wine country is so beautiful! Hubby and I were there visiting about 5 summers ago. We loved Napa and the wonderful tours but we were shocked at the prices of homes in the area compared to where we live. Our home, that we purchased for about 160,000 would be close to a million there. Those caves are just awesome, what a neat place to have a party. Thanks for sharing this neat tour. My husband and I will be in Napa next month for a party, I think we will tour over to the winery. It looks like a lovely (Bella) place. Keep dry and warm, it sure has been a raining day in the Bay Area. Yes you are so right -- it is a beautiful place -- love touring the wineries in California and in Oregon. I've visited the California wine country, Sonoma and Napa, and it is lovely. The cave reminded me of the vineyards we visited in Southwest France where my family live.............I could easily live in either place - beautiful scenery, wine, olives, cheese and good bread, what more does one require to be happy!! Really lovely, and your wonderful post reminds me that I need to make a trip out West sometime soon! My Biggest Design Challenge Yet!